In this resource, pupils need to name the ten countries that have exactly 4 letters in their name. You can choose to differentiate with atlases or world maps. In this starter, pupils need to think of countries beginning with certain letters. There are 8 letters in total so it can be used again and again. You can differentiate by using atlases and by setting the task for individuals, groups or as a whole class.. In this starter, pupils need to name as many countries as they can with the letter Z in their name. 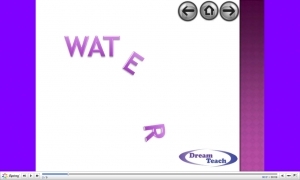 These catchphrase resources act as an excellent starter at the beginning of the topic. It get pupils thinking of topic keywords, as they simply say what they can see!! Pupils simply guess the country from the clue. 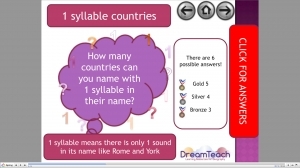 In this starter, pupils have to guess the names of countries with certain amounts of syllables in them. It can be differentiated with the use of atlases or by getting a class to work individually, in pairs or as a whole class to find them. The targets.. 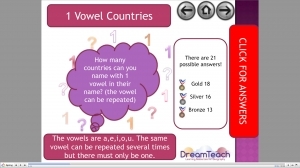 In this resource, pupils need to guess as many countries as they can with certain numbers of vowels in them. It can be differentiated with the use of atlases or by pupils working individually, in pairs or as a class. The medal targets are aimed at a.. These are general dingbats to use as a quick starter/ game. This is a general Geography starter that could be used to start any Geography lesson. 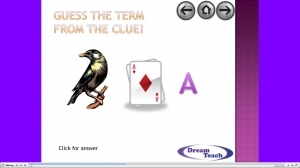 There are continent and 1st letter clues to help the pupils. You can decide whether they can use atlases or not! These catchphrase resources act as an excellent starter at the beginning of the topic. It get pupils thinking of topic keywords, as they simply say what they can see!! Pupils simply guess the UK city or town from the clue. This game is similar to the prize round on the generation game. Pupils need to remember as many terms or objects to do with the topic as they can, without writing them down. When the timer has stopped they could then write them down or answer.. These catchphrase resources act as an excellent starter at the beginning of the topic. It get pupils thinking of topic keywords, as they simply say what they can see!! Pupils simply guess the world city from the clue.